Spicy Treats: Fruit Custard / Mixed Fruit Custard - Easy Fruit Dessert Recipe. Fruit Custard / Mixed Fruit Custard - Easy Fruit Dessert Recipe. First in a small bowl add 2 tbsp custard powder and 1/4 - 1/2 cup milk and mix without any lumps and keep aside. Now heat remaining milk in a sauce pan and bring it to boil, after that add sugar and custard powder milk mix and keep stirring and cook for 3-4 minutes or until it thickens to a creamy texture. Do not boil for long time, custard get thickens after cooling so switch off once it reach little thick n creamy not wait till it thicken completely. Switch off the stove and add cardamom powder. Allow this to cool completely and add chopped fruits to it chill and serve. chilled fruit custard tastes great. You can also use plain custard powder and for flavor add 1/4 tsp vanilla to the cooled custard. 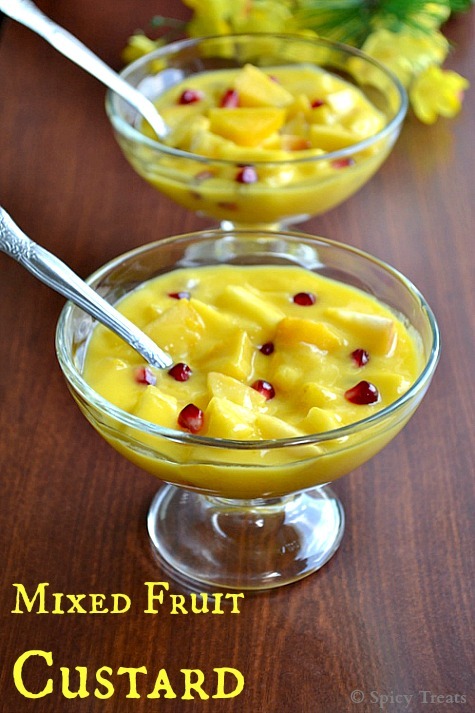 For Mango custard use 1/2 cup fresh/store bought mango pulp to the cooled custard and mix it with fruits and serve. 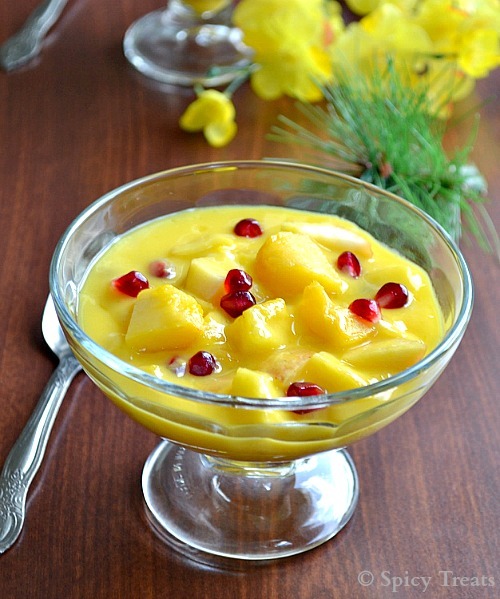 Do not add fruits when the custard is hot or warm , if so will give u mild bitter taste. Add sugar or honey to your taste. For more rich n crunchy taste, just before serving add some finely chopped/crushed pistachios/walnuts/almonds or any desired nuts. Fruit custard looks absolutely incredible Sangee, i can die for this fruit dessert, beautifully presented. No doubt it is a simple and best treat. I like your B & W picture with recipe card. So neat and attracting. Simply delicious !! looks YUM !! Colorful and such a yummy mix loving it. even i prepare this in the same way..it looks absolutely beautiful.. This is one of the simple and heavenly dessert. My all time fav dessert.looks very yummy.lovely pictures. the only thing which i do not like in the custard is adding pine apple ! :( But your photos are stunning ! let me try with mango alone ! as uma said simple and best recipe sangee :) perfect for this season.. Delicious and yummy fruit salad!